Detail from The telephone room, Melbourne Exchange. The US entrepreneur Edison, who boosted telephone microphone levels, chose the word ‘Hello’ to begin a call whereas the original Scottish inventor Alexander Graham Bell preferred ‘Ahoy’. ‘Hello’ and ‘Hi’ gradually made their way into general, non-shouty use as a greeting. The more modern ‘Hey’ seems to have made a similar journey. 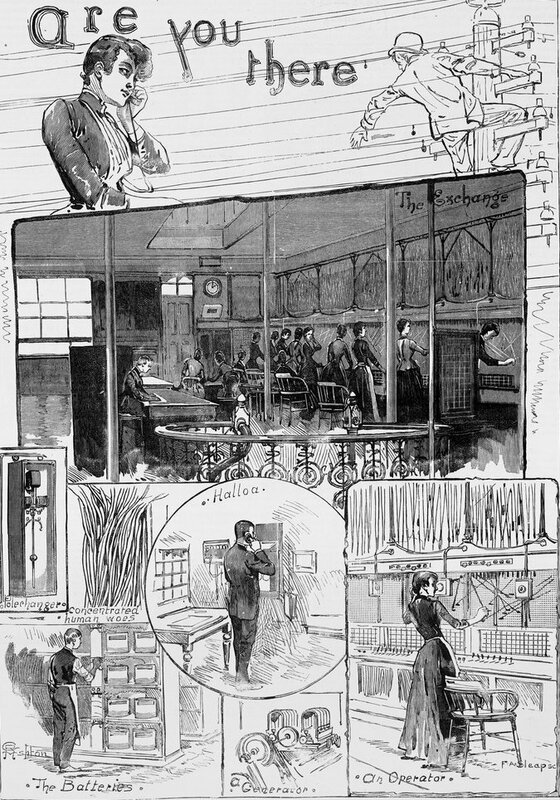 In 1881 the Australasian Sketcher newspaper published a wood engraving of scenes drawn by Julian Rossi Ashton at a Melbourne telephone/telegraph exchange, probably at the central GPO (General Post Office) on the corner of Bourke and Elizabeth Streets. Check out the quill pen being used at the desk. Men were the supervisors and technicians of this new technology using telegraph lines; banks of enormous chemical batteries powered the exchanges. 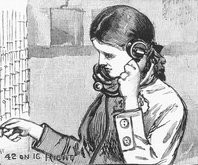 In the US, telephone exchange operators were called ‘Hello Girls’. Their Melbourne sisters in the 1890s, called ‘Telephone Girls’, wore corsets, sweepingly long skirts with aprons, and fitted long-sleeved bodices. It must have been hard for them travelling to and from work to keep their hems out of the notorious Melbourne mud, or the summer miasma of horse poo and dust. Their job was to plug and unplug lines to connect and disengage the few ‘early adopters’ who had a telephone in their business or home. Looking at stationery letterheads in the Library archives printed by the Troedel company from around the turn of the 1900s, it’s tickling to see phone numbers such as ’31’ and ‘2’. By 1890 another engraved collage of sketches, also probably done at the GPO, was published in The Illustrated Australian News, this time drawn by Julian’s brother George. George put a lot of life into his illustrations: the linesman at the top right, in the below illustration, is unprotected (aside from his bowler hat) and untethered at the top of a telegraph pole, taking his chances with voltage and the distance to the ground. The women workers are leaning, turning, reaching. It must have been a long day, or night shift, on their feet. George captioned a drawing of the spaghetti-style wires ‘Concentrated human woes’. People didn’t tend to use the phone to chat in those days; it was a novelty and kept for business or ‘important’ news, which was often unwelcome. A book called Murder In the Telephone Exchange, by a Melbourne mother of five, June Wright, was published in 1948. It evokes a post-war world of dragonista supervisors, returned soldiers, routinely sexist police, and Melbourne girls from the country living in inner-city boarding houses and coming in by tram to work as operators at the Lonsdale St exchange. The murder weapon is a ‘buttinsky’, the device used by supervisors to interrupt calls on the telephone lines. 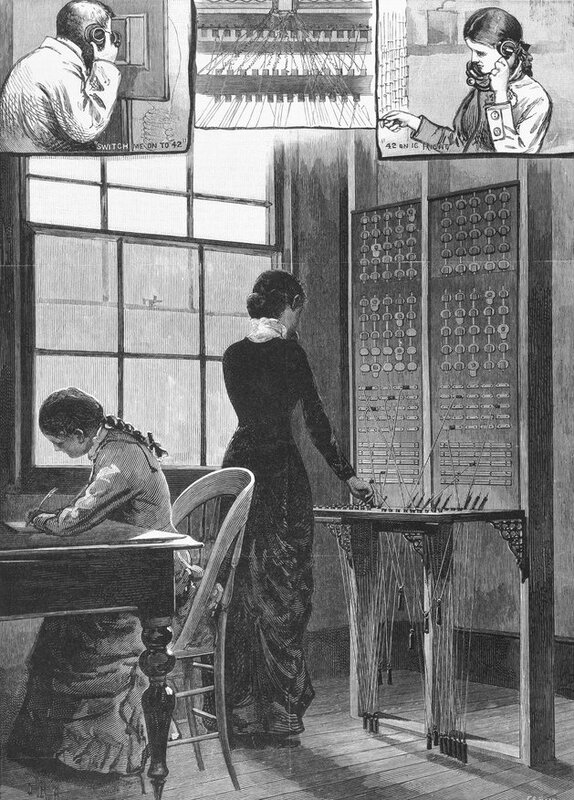 Conversations were short, not least because of the widespread suspicion that the Telephone Girls would eavesdrop: in truth they were usually too busy. Calls were often shouty, too, as people wrongly presumed the person at the other end couldn’t be clearly heard. The same thing happens today in every tram and train carriage as stentorian mobile phone users blithely bellow out details of their love life, work and lunch choices. There’s also the book The phone book: the curious history of the book that everybody uses but no one reads, by Ammon O’Shea. It explains how the early US telephone directories instructed callers to begin by saying ‘Hulloah’. 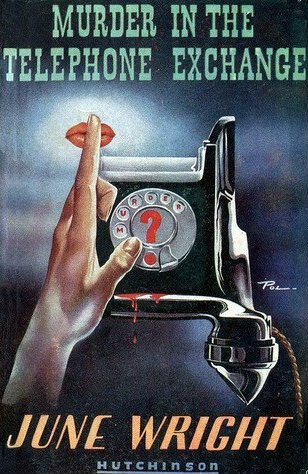 Although I have always preferred to end a call by announcing, ‘I shall ring orf directly’ or ‘Goodbye, goodbye’, the directories instead recommended: ‘That is all’. Kaz has chosen items from the collection for the exhibition ‘What Have You Come As?’ as part of Changing face of Victoria– a free exhibition in the Dome Galleries at the State Library. It features fancy dress, jewellery, hats, photos, a Coles cafeteria apron and a Communist sock. It’s on until November. Fascinating stuff! Imagine if we were all saying áhoy” to answer the phone. I must get hold of that book, Murder in the Telephone Exchange, my Mum worked in the Lonsdale Street exchange during WW2, and yes she was from the country, and lived in an inner city boarding house. Thanks for the article Kaz. And then there was the etiquette of the ‘party line’ – a single telephone line shared by multiple households or businesses. Perhaps that was mainly a country thing? According to my great-aunt (born in the 19teens), the bell on your ‘instrument’ (no handsets in those days) would tinkle when somebody else on the party line rang the exchange; in theory this would alert you to delay your own call, so as not to interrupt the other person’s conversation. Imagine the temptation to eavesdrop! Yes indeedy. There were many music hall (vaudeville) sketches based on misunderstandings and the consequences of naughty eavesdropping, right up until the 1950s. I’m sure your great aunt never did any such thing. Well this does ring a bell. We had a district party line of six on the farm and our ring was ‘four short’. The fire alert was one long ring and we knew to yell for mum to answer and we would stand still to hear the tone of her voice. When we used our phone and a rooster was heard we knew a particular person was eavesdropping and other eavesdropper’s barking dogs also ‘put their pot away’. Our phone was on the wall, [one stood to talk] with a little crank handle to ring, and a voice funnel piece and an listening device joined by cord similar to the ‘Switch me on to no. 42’ sketch. We had the party line until 1968/69 when the automatic exchange came in at our Langley Exchange in North Central Victoria. I started to work at a Melbourne city bank in 1957 and was embarrassed to use their strange phones. Our electricity connection came in late 1950s.